(Tech Xplore)—Big questions about humanity's future also merit a side question over humanity's future alongside machines. How long before AI outperforms humans in various tasks? A bracing new study presents responses from professionals working in that field. "When Will AI Exceed Human Performance? Evidence from AI Experts," is by Katja Grace, John Salvatier, Allan Dafoe, Baobao Zhang and Owain Evans, and it is on arXiv. Actually, this paper reveals not if this will happen but when, asking how many things will AI be able to do even better than we can? "Researchers believe there is a 50% chance of AI outperforming humans in all tasks in 45 years and of automating all human jobs in 120 years." Yes, all. Interestingly, Asian respondents expected the dates much sooner than did North Americans. Discussing the study, MIT Technology Review said, "While North American researchers expect AI to outperform humans at everything in 74 years, researchers from Asia expect it in just 30 years." The study is from University of Oxford and Yale University, with 352 people responding. How familiar were respondents with the topic? "Our survey population was all researchers who published at the 2015 NIPS and ICML conferences (two of the premier venues for peer-reviewed research in machine learning). A total of 352 researchers responded to our survey invitation," they wrote. The researchers asked 1,634 and 352 responded. A key phrase to note in examining this study is "High-level machine intelligence" (HLMI). The authors explained that this intelligence level is "achieved when unaided machines can accomplish every task better and more cheaply than human workers." Researchers predicted AI will outperform humans in many activities in the next ten years, such as translating languages (by 2024), writing high-school essays (by 2026), driving a truck (by 2027), working in retail (by 2031), writing a bestselling book (by 2049), and working as a surgeon (by 2053). In general, any talk of AI in future years shows that predictions and estimates regarding artificial intelligence send some running under the blankets. They have fearful expectations of machines not only outperforming but overtaking mankind. Somewhere closer to the center of debate, however, are simply those who say the advancements are inevitable, and we had best be prepared for changes. "The reality is that AI will have a dramatic impact on all aspects of people's lives, and it's going to happen sooner than most of us realize," wrote Ryan Bort in Newsweek. "The consensus arrived at by the world's top AI researchers bears this out. Admittedly, it's a little frightening, especially if you have a job that involves anything technique-based or formulaic. Yes, that includes bloggers." The authors did not ignore the question of AI safety expectations, asking respondents if HLMI's impact would be positive or negative. 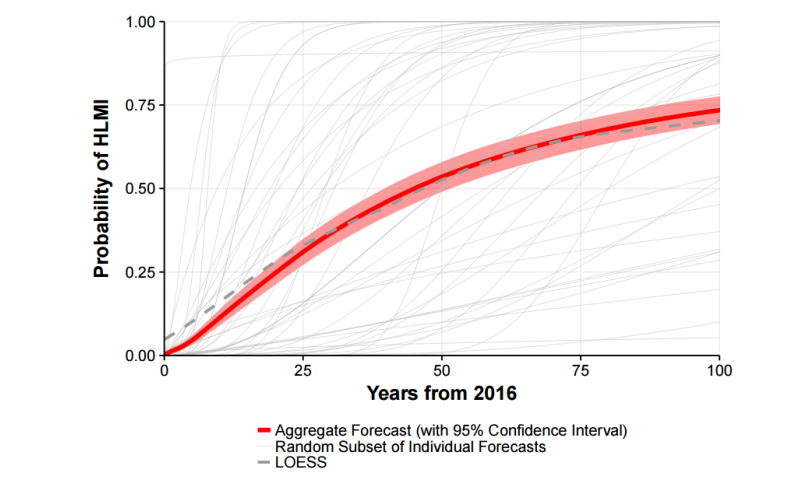 "What are the chances this will lead to extreme outcomes (either positive or negative)?" HLMI is seen as likely to have positive outcomes but catastrophic risks are possible. Respondents were asked whether HLMI, over the long run, would have a positive or negative impact on humanity. They assigned probabilities to outcomes on a ﬁve-point scale. The median probability was 25% for a "good" outcome and 20% for "extremely good" outcome. The probability was 10% for bad outcome; 5% for an outcome "Extremely Bad" (e.g., human extinction)." But perhaps the last word about this report belongs to TechRepublic's Conner Forrest. "While the findings may seem extraordinary, it's worth noting how limited current AI and machine learning systems are. There is still substantial human involvement in wrangling, cleansing, and processing the data needed to power these algorithms, and most AI is extremely narrow in its focus." I do see capabilities of AI systems grow by leaps and bounds at every conference. However, remember that AI research had some immense successes when it was first started but then fell into a lull for almost 20 years in the mid 1980's to the early 00's where no significant advancements were achieved. Making a robust projecting of the capability increase on the basis of this history seems...iffy. The biggest unsolved problem that would help AI along seems to be how to make it (self-)conscious. But so far no one has made any big inroads on this (at least to my knowledge). On the other had I don't see the 'narrow focus' as much of an issue. Currently many AI applications use boosting and decision weighing (boosting uses many 'weak learners' instead of one single 'strong learner'. It's a bit like crowdsourcing from sources that are each slightly better than a random guess). This approach lends itself to massive, multipurpose AI. This is completely stupid. Some tasks do not need optimization and can be no better performed by humans or robots, due to the insurmountable amount of information, problem space exploration, and simple power/observation output. Clearly human assisted AI interaction is preferred, but if you permit neuromorphic chips and the computer to train on humans to find the bounds of auto-encoding for noise reduction, you clearly are blurring the lines. By allowing a machine to mirror the territory, what is machine and semi-autonomy in motion is not so easily dictomized. Now if they mean all tasks I also hope they do not mean inter-species predation. Some people are so deluded as to think that is our Nature, when objectively no one understands self reference in its entirety. If it were so and were intelligent it could find the means to create swarms of integrated information and their dispersal in an unending loop. No smart intelligence kills, yet impulse and delusion abound. A leader seeks zeros. Before anyone panic's I'd remind everyone the prediction that flying cars would be common by now. These predictions are from the people who are driving the technology and who stand to gain from the general belief that the technology is inevitable and necessary. Note also the side gap in the predictions from Asian versus Western groups. This is as much guessing as science and guessing is always skewed by personal preference. "The biggest unsolved problem that would help AI along seems to be how to make it (self-)conscious. But so far no one has made any big inroads on this (at least to my knowledge)"
-To make AI 'self-conscious' in the presumed human sense you would have to give them a desire to survive to procreate. And why pray tell would you do that? 'Self-conscious' (perhaps self-aware is a more appropriate term) is different from consciousness, a thing which does not exist. I feel like we should continue to try and model an AI after ourselves, and try to build a similar conscious/subconscious structure to its 'mind'. Perhaps it could not feel "overwhelmed", but it would be helpful for us to relate to the AI if it had a similar way of 'thinking'. A lot of the "AI" people are claiming, is just huge data sets and applied algorithms to find the statistically probable solution/answer. That is helpful and nice, but I feel the goal of True AI is to actually make something that Thinks, not just serve a purpose. And By "thinking", I mean something that can gather data from around itself, reconstruct what is happening in its mind, and try to draw conclusions from it, much like we do as children and as adults. Distribution is the key. AI is already powerful enough to "take over" lots of things, but the technology needs to be disseminated and refined. Also a more useful question would involve predicting how economic theory must evolve to compensate for AI's undermining how people work, and how AIs drastically shrink job markets. "I feel like we should continue to try and model an AI after ourselves, and try to build a similar conscious/subconscious structure to its 'mind'. Perhaps it could not feel "overwhelmed", but it would be helpful for us to relate to the AI if it had a similar way of 'thinking'... "
For all such similar comments: before we could replicated a self aware AI in software or hardware we would first have to have a complete understanding of what consciousness really is. One cannot build what one does not understand. "we would first have to have a complete understanding of what consciousness really is." -That's easy. Consciousness is a fanciful construct created by philos as a replacement for the soul in the post-enlightenment era. Science-minded people just cannot give up the idea that there is something about themselves that can and should escape death. Philos, like the priests before them, exploited this desire for selfish reasons. Machines are already self-aware. Your car will tell you when it's door is open, it's oil is low, or it's engine needs servicing. It adjusts it's fuel mix to compensate for atmospheric changes. It will even tell you how fast it's going and where it is located. Soon they will be self-aware to the point where they will be better drivers than us. We certainly don't need to distract them with thoughts of procreation. Consider for a moment what it will mean for there to be no jobs; the machines will be running the machines, fixing the machines, making the machines and making the decisions. On the surface, it sounds like a pretty good deal --everyone will have all the leisure time they can handle, there won't be any need for people to do anything beyond eating, pooping, socializing and procreating and everyone will be living the dream-life of a useless Hollywood socialite. But underneath, below the veneer of blissful, ignorant pointlessness lays the dark flip-side of the coin; the machines will be running the machines, fixing the machines, making the machines and making the decisions...once that happens, what more need is there for Humanity? How long will it take for an A.I. in charge of running governmental functions to realize that humanity is unnecessary and inconvenient, that we're no longer anything more than house-pets? One cannot build what one does not understand. Good comment, though for rebuttal: Unless humans incorporate a machine evolutionary process by which survival benefit plays a large role in guiding the progression of AI. After all, this is how Nature governed our own evolution, developing our own brains/minds, which we may never completely understand, and posing an interesting question whether humans are a spectacular accomplishment by Nature, or a self-gratifying and formidable destructive force. My own gut feeling is that we wont be around long enough to see any such outcome. AI will never be conscious unless it is DNA based. Its ridiculous to think that a hardware (transistor on-off switch based) machine is in some way equivalent to a molecular-atomic-subatomic-waveparticle-and-whatever-the-heck-is-below-that, based organism. This is the perfect example of the fallacy of false equivalence. Without consciousness, there is no experience whatsoever - no seeing, hearing, tasting, touching, smelling, or feeling, and most importantly, no Knowing, which is the essence of awareness. None of these things can be coded directly into a mesh of on-off switches except on a trivial level. For these reasons, AI will never "care" about anything. It will have no desires whatsoever, although the programmers could make it respond to specific inputs as if it did. But AI "wanting" to take over the world and "get rid of humans," is not going to happen unless that behavior is coded in by human beings. There's really nothing to fear here, except inhuman, human beings.